It’s the Easter Season and “all creation is shouting for joy,” but part of me is going back a couple weeks to where Mary meets her Son on the road to Calvary. As any mother knows it’s far better to have pain and sadness yourself than to watch your child go through it. But, you’re a mother, and it’s in your job description in really, really fine print. Medieval Christmas carols would often have the shadow of the cross stretching across the lyrics. There’s a mention of what is to come, lest we forget that, even though we’re Gaudete giddy, it won’t always be that way. 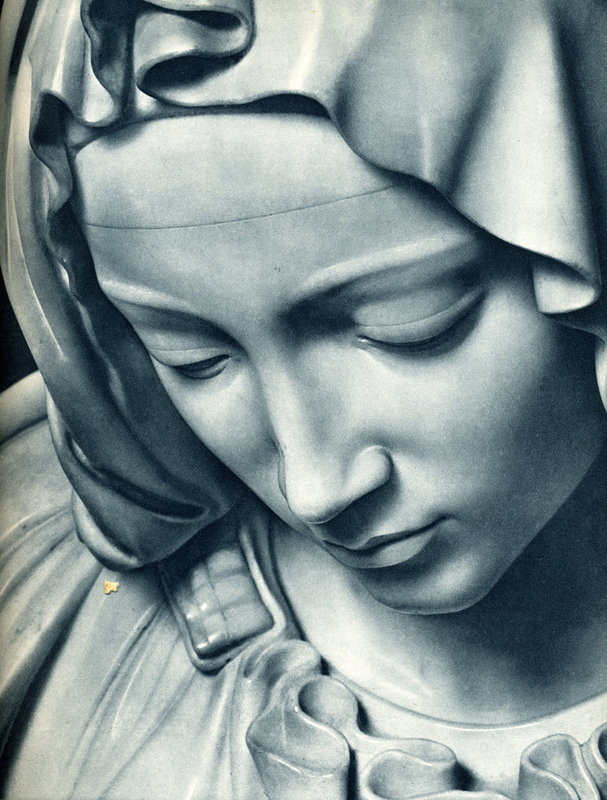 Mary had her seven joys, but she had her seven sorrows to counterbalance them. There will be sadness coming and for every lovable, smiling Anna there’s a stern Simeon waiting to deliver the bad news. But we choose to dismiss the inevitable, wanting instead to think about the joys. I know I did. I remember the day I gave birth to her, lying in the hospital room watching her wiggling and stretching in her blanket. The minute I knew of her existence we started having a conversation, so by the time she entered the world I knew her. I fantasized about what was to come; home made Christmas ornaments, Popsicle sticks, brownie uniforms, peanut butter kisses. I was ready to help her understand and work through the painful side of life; when her best friend would leave her crying on the playground after harsh words, when she would have to endure the teenage years of self doubt and confusion, the grief of her first crush break-up and the overwhelming loss of her grandmother. But it ended there. I didn’t think about having an adult child having to go through adult things. What happens so often when adults are going through adult things is that their children become innocent bystanders who end up having their spirits trampled and their hearts broken. They are handed a grief that they didn’t ask for and didn’t see coming. But my adult child, going through sorrow herself, is going to have to watch her children suffer and I can’t put a band-aid on that hurt or make anything feel better. I’ve been through many, many Good Fridays and so I know there’s an Easter on the horizon, but she can’t see that right now. When Mary gave her fiat to the Angel Gabriel she couldn’t have seen that Good Friday was waiting for her. The Incarnation of our God meant that she would have to watch her Son suffer terribly and all she could do was stand by and let him finish what he started. And now I must do the same for my child. But, as always, I’ll be there for her when she needs me, even if it’s only to look down and see that I’m standing by her cross. This entry was posted in The Church Diva and tagged Children, Cross, divorce, Easter, Good Friday, Mary, Motherhood, Suffer. Bookmark the permalink.